Mam Sonando is escorted into a prison van after his verdict at the Phnom Penh municipal court on Oct. 1, 2012. The U.N.’s special envoy for human rights in Cambodia has paid a visit to a dissident convicted of masterminding a secessionist plot in Kratie province, as another rights activist was summoned to court in connection with the case. U.N. Special Rapporteur Surya Subedi met with Mam Sonando, director and owner of the independent Beehive Radio station, at the No. 1 Correctional Center in Phnom Penh on Wednesday while on an eight-day fact-finding mission on the human rights situation in the country. The visit came just days before a hearing on a request for bail by Mam Sonando, who was jailed in October on charges of organizing what authorities deemed to be a secessionist plot by villagers to form a self-governing zone. The 71-year-old activist has been in poor health since his arrest and an appeals court is scheduled to hear his request on Friday. His wife Din Sophanara said Subedi’s visit would boost Mam Sonando’s morale ahead of the hearing. “This visit is an honor for Mam Sonando,” she told RFA’s Khmer Service after the meeting. “It is a form of moral support,” she said, though she said she did not know the details of their conversation. Subedi is in the country to review progress on recommendations he made to the government two years ago, and during his trip he has urged officials to allow greater freedom of expression, land rights, and the independence of the judiciary. Mam Sonando’s case, which U.S. President Barack Obama raised with Prime Minister Hun Sen during his historic visit to Cambodia last month, has drawn criticism from international rights groups who say the case against him is politically motivated. In October, Mam Sonando was sentenced to 20 years in prison for defaming the government and orchestrating a secessionist plot tied to a land dispute in Kratie’s Chhlong district, where a mass occupation of land and bloody clashes in May triggered a security clampdown. 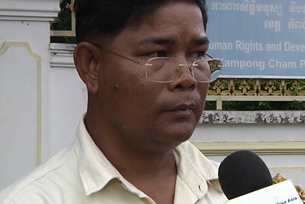 Mam Sonando has denied the charges and filed an appeal against his conviction. A date has not yet been set for a hearing on the appeal. Friday’s court session will address whether or not Mam Sonando is at risk of fleeing from custody if released on bail, his lawyer Sar Sowath said. “This is a hearing for the judge to determine whether Mam Sonando would flee [if released] or if he is sick enough that he can be granted bail,” he said, adding that the activist’s health is deteriorating. He expressed optimism that Mam Sonando would be granted bail because he is too sick to leave the country. A lawyer representing the eight others sentenced in connection with the case said they have not requested bail, but seven of them have also filed appeals with the court. “They have appealed the court decisions because they can’t accept those decisions,” lawyer Long Lon said, adding that they had asked the court to speed up the case. The eight were convicted of allegedly staging an anti-state rebellion following a mass occupation of land that triggered clashes in May. The clashes occurred after some 1,000 village families refused a government order to vacate state land they had used for farming which was awarded as a concession to Russian firm Casotim. The company plans to build a rubber plantation at the site. This week authorities took steps against another prominent activist in connection with the case, issuing a fresh court summons to Chan Soveth, senior investigator for the Cambodian rights watchdog ADHOC. The summons, delivered to Chan Soveth on Tuesday, orders him to appear before the Phnom Penh Municipal Court on Dec. 24 to answer charges that he “assisted perpetrators” in the Kratie land revolt. He is accused of financing villagers who planned to establish the self-governing zone and, if convicted, faces one to three years imprisonment and a fine of U.S. $500 to $1,500. Chan Soveth said he will testify before the court, but expressed concerns about the judge’s independence. “People have criticized the court for not being independent … I would like to deny that I have committed any crime,” he told RFA’s Khmer Service. The summons, dated Nov. 30 and issued by Phnom Penh investigating judge Chhe Virak, is Chan Soveth’s second in connection with the case. He was previously summoned to appear in court on Aug. 24, but the questioning was delayed while he was on a trip outside the country. The August summons came shortly after Prime Minister Hun Sen gave a nationally televised speech condemning groups in the land revolt and calling on an unnamed NGO worker to “confess” his role in assisting the Kratie villagers. ADHOC issued a statement on Wednesday defending their employee, saying Chan Soveth had done nothing wrong and always conducted his work in accordance with the law. “Before more details on the specific information Judge Chhe Virak is looking for are disclosed, ADHOC would like to stress that it has always conducted its activities in accordance with the law,” the statement said. “The granting of bail for Mam Sonando, and, ultimately, a successful appeal against his conviction, would signal to the international community that Cambodia is back on course to becoming a country that respects and promotes human rights,” the statement said.